Product information "SHARP R28STM 800W 23 LITRE MICROWAVE STAINLESS STEEL"
This great value solo microwave will satisfy all your culinary needs. It offers a huge range of auto cook programmes, as well as express settings for food in a hurry. And, its freestanding stainless steel design looks great too. The R28STM is a perfect family microwave. This 800 W model lets you cook in different ways for great results, every time. Place your food in the spacious 23-litre cavity and select from five power levels. You can then set the time yourself. Alternatively, built-in auto menu options allow you to select a meal type or ingredient. These programmes will perfect everything from fresh vegetables to pasta or meat. The microwave will set an appropriate power level - all you need to do is select the weight of the portion. This takes the guesswork out of whipping up something quick and delicious. Delay Start will come in handy for more complex meals. Get your ingredients ready to cook and set the programme to begin when you’re ready. The microwave will remember for you, so you’ll never forget to heat up your sauce or vegetable accompaniments again. The R28STM’s Express Defrost programme will get your ingredients to a safe cooking temperature in no time at all. This handy function is set by weight or time for complete flexibility. You can even choose the Sequence Cooking option, which lets you defrost and then cook your food without having to re-programme it in between. Sharp have packed all these great features into the R28STM‘s stunning freestanding design. The stainless steel finish adds a contemporary touch to your kitchen worktops, and the bright digital display is clear and stylish. Its rotary dial controls couldn’t be any easier to use. Cook the way you want to with Sharp’s R28STM microwave. Buy yours here and make more convenient meals. 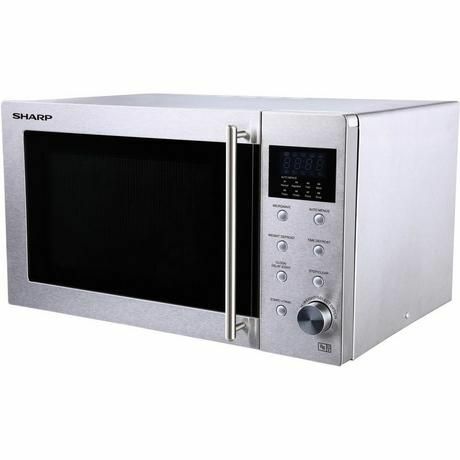 Related links to "SHARP R28STM 800W 23 LITRE MICROWAVE STAINLESS STEEL"
Further products by Sharp Electronics(Uk)Ltd. Customer review for "SHARP R28STM 800W 23 LITRE MICROWAVE STAINLESS STEEL"